Life imitates art: Sure, at first look this doesn't appear to be a very Bust-worthy card. Yes, the sky is green and yellow, and, yes, the moon is being eclipsed by Rickey's flattop, but nothing too ridiculous. Even the symbolic wings on Rickey's shoes are tastefully drawn. And that's where the story begins. 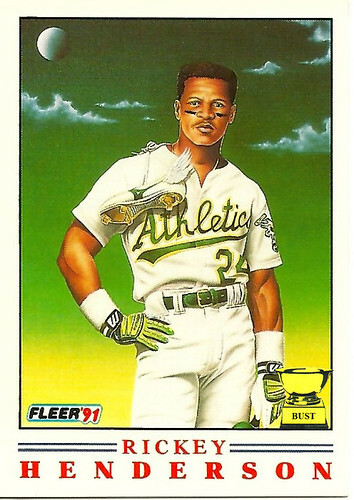 Rickey, upon seeing this card during spring training in 1991, was struck by inspiration. A master craftsman, Rickey fashioned his own shoe-wings out of Dennis Eckersley's mustache wax in an effort to make himself faster. "Time for Rickey to fly," he was heard muttering to himself in a dark corner of the locker room. The wings, of course, did not make Rickey faster and actually caused large grease stains on the cuffs of his pants, earning him a new nickname: The Streak.